Eat your greens. Exercise regularly. Drink more water. Most of us know the basic things we should be doing to have healthy habits. But, like most habit changes, it’s hard to do – even if you know it’s good for you. I’d like to suggest that making a habit of learning is possible and valuable, even if you feel so busy that your leaky faucets and emails seem to have a prominent role in your nightly dreams. To be clear, I’m talking about learning that helps grow you, as an individual. Webinars are great and may be the next step you need, but I’m talking about the type of learning that doesn’t get the direct reward of Continuing Education Credits. I’m talking about a personalized learning approach that will benefit you as an individual. It will help you in the big- picture of your career, but also on the micro-level of your daily stress and satisfaction levels. Why should you bother making learning a priority? The benefits of staying aware of innovations and changes in the industry are huge. But, there’s even value in simply being reminded of things you already know. 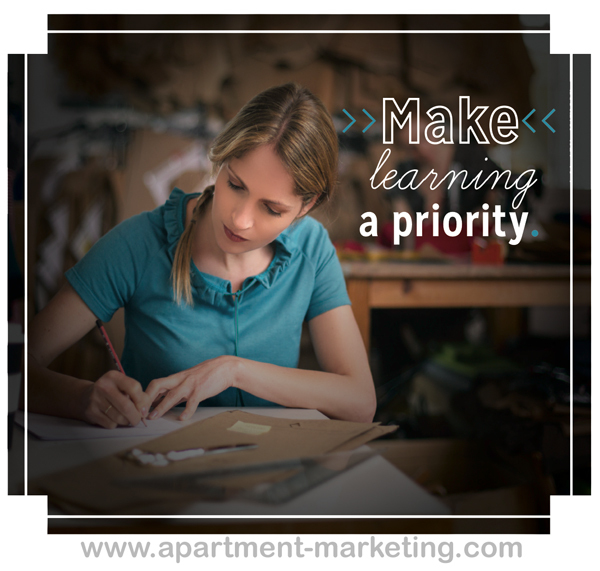 Being reminded to look at your organization through the eyes of your average renter can be simple but refreshing and motivating. Making a habit of learning will make you feel more confident and can even reduce stress levels that arise from feeling ill-equipped or overwhelmed with unknown challenges. Try listening to my Multifamily Profiles Podcast on your commute or on your lunch break or read a few articles on a topic you felt insecure about in the last company meeting. Click here for 10 specific ideas about how to incorporate learning and growth into your schedule. Establish a small, realistic goal and then when you make it happen, celebrate the win. What are the topics that would help you enjoy your work and do more excellent work? How can you create a habit that incorporates learning about these topics in your routine? Think about it. And let me know in the comments.